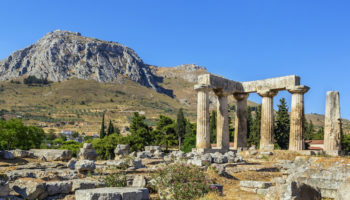 Athens is a city that has been built, conquered, built and conquered throughout history. The conquering culture would build the city up in its own image only to have part of it torn down when the city fell once again. This ebb and flow of building and ruining have left a unique multicultural tapestry behind. It’s truly a city to behold. A new young culture is now conquering Athens peacefully. You’ll find graffiti-lined streets selling anti-capitalist literature in the shadow of towering ancient buildings. This new culture is making bits of Athens in its own image, but the ancient sites and history of the city are left untouched. Celebrate the long history of Greece by day and then party deep into the night. Take seaside strolls ogling at yachts and then check out some hard rock in the anarchist district. 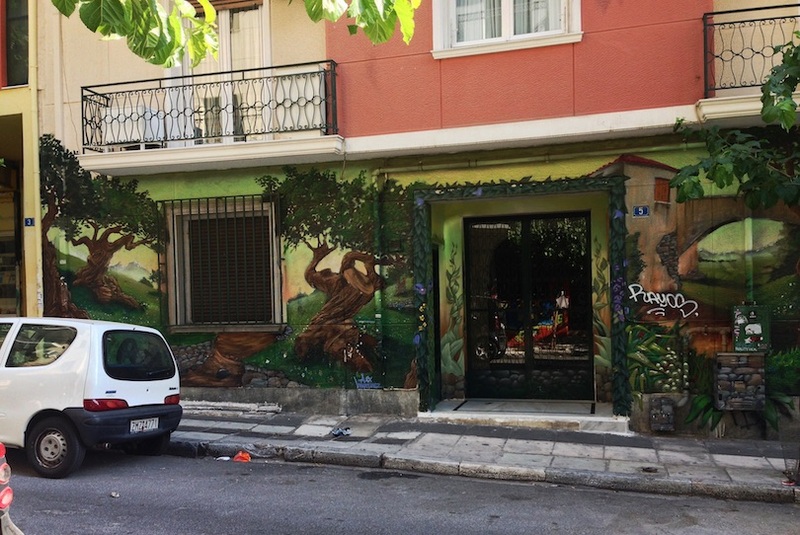 Athens is a city of extremes with everything in between and it is all reflected in its neighborhoods. Choose the right district for you when you visit The City Of The Violet Crown. 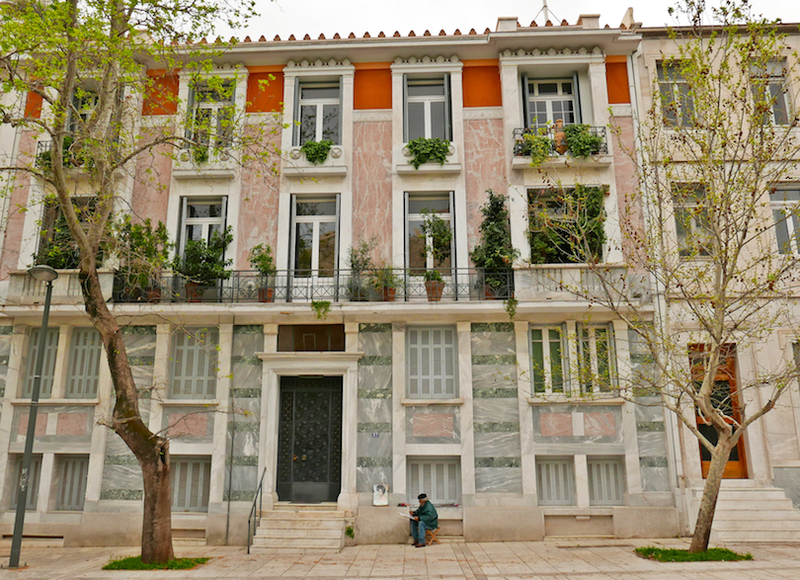 The Plaka is the oldest neighborhood in Athens. You’ll find it underneath the Acropolis and the neighborhood spans all the way to Syntagma. Two main pedestrian thoroughfares make up the Plaka — Kydathineon and Adrianou — and the intersection of the two is generally thought of as the center of the district. The entire neighborhood is paved with cobblestone and most of the ancient neighborhood’s roads are off limits to cars. Although, you’ll still have to watch out for the occasional scooter or delivery truck. The beautiful streets are lined with restaurants, cafes and shops. The Plaka is well known as a tourist destination so many of the restaurants and shops cater to the expected clientele. You’ll have to dig a little deeper on the menu to find something authentic and you’ll have to be careful to avoid mass-produced trinkets in the shops. But if you look in the right places, you’ll find genuine food, handmade jewelry and some incredibly inventive souvenirs. Electra Metropolis – A world of elegance and style awaits at this 5-star hotel. Located just steps from Syntagma Square, the crowning glory of the Electra Metropolis is its stunning rooftop area – featuring both a pool and a restaurant, with views of the Acropolis. Enjoy sunset cocktails at the bar overlooking the city. The rooms are modern, decorated in blue and white, and come well equipped; some even feature private balconies. The hotel lobby is a grand affair, complete with a skylight atrium. Electra Palace Athens – The Electra Palace Athens features sophisticated rooms that display a classic yet modern sense of style, with wooden furniture and elegant bathrooms. 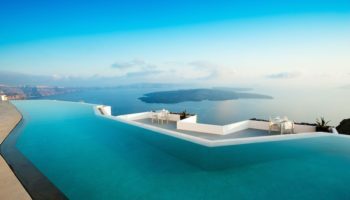 There’s a beautiful rooftop pool and sundeck which faces the Acropolis. Guests can enjoy a fresh Greek breakfast in the morning, whilst evening meals at the rooftop restaurant offer up a Romantic atmosphere. Getting around Athens is made easier thanks to the nearby metro station, too. Adrian Hotel – This modern, purpose-built hotel features a marble spiral staircase leading to bright and airy rooms decorated with houseplants and chic soft furnishings. Some rooms at the Adrian Hotel boast balconies overlooking the buzzing streets below. Views of the Parthenon can be enjoyed from the rooftop terrace – perfect for evening drinks. 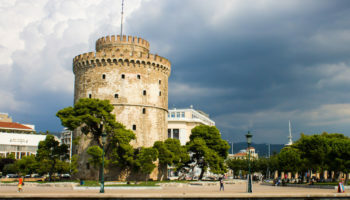 The Monastiraki Flea Market and the ancient Agora are just a few minutes’ by foot from this affordable hotel. It may be centrally located, but it’s a calm environment away from the tourist crowds of the surrounding streets. 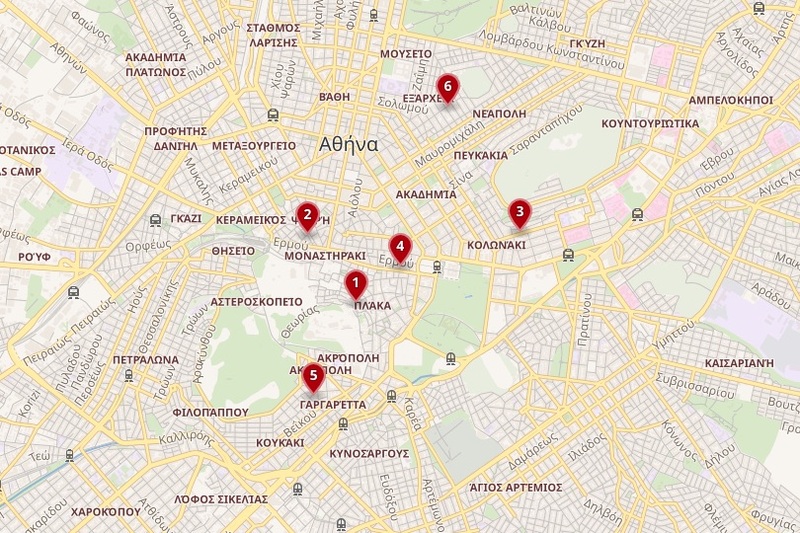 The Monastiraki and Psiri neighborhoods are right next to each other in the heart of Athens. 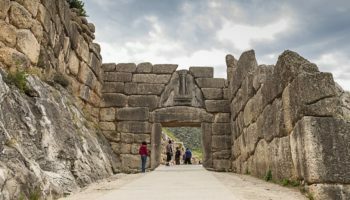 These districts offer you first-hand experiences with some of Greece’s most prized sites as well as stunning views of the Acropolis. You’ll find the Stoa of Attalos, the Ancient Agora and the ruins of the Hadrian’s Library in Monastiraki. The bustling neighborhood attracts visitors from all over the world so the streets are lined with cafes, restaurants and shops. 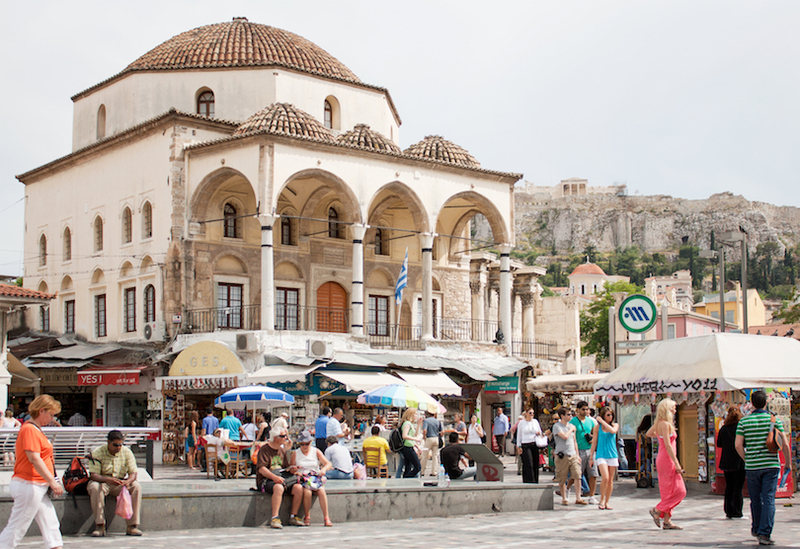 But you’ll find the most authentic souvenirs at the famous Monastiraki Flea Market. 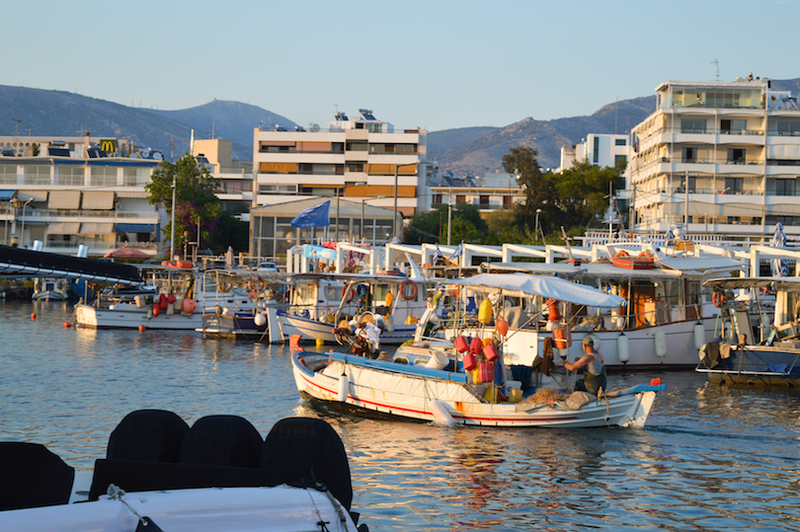 Psiri, just to the north of Monastiraki, is a well-known hub for nightlife. Head to the vibrant Iroon Square to visit one of the neighborhood’s many tavernas, live music venues and clubs. You’ll find off-beat souvenirs in shops covered with graffiti as you navigate the maze of bars. This small piece of Athens is known to stay up late. The Zillers Boutique Hotel – Highly polished parquet floors, ornate ceilings, and chandeliers are just some of the sumptuous details of this boutique hotel. Set in a historic building, The Zillers Boutique Hotel has seamlessly combined its period features with on-trend modern comforts and design. Each room even comes with the complimentary use of a smartphone, which makes exploring Athens that much easier. The hotel restaurant and bar boast fabulous views of the city. The bustling Adrianou Street is nearby, as is the ancient Agora. Attalos Hotel – A great location for those wanting to get around the city using public transport, this 3-star hotel is just a couple of minutes’ walk from the nearest metro station. It’s also within easy walking distance of many of Athens’ top sights, such as the National Archaeological Museum and the Temple of Zeus. The rooms at Attalos Hotel are small and compact but airy and bright, with light wood floors and white walls. There is a roof garden where guests can enjoy a drink with a view in the evening. Athens Center Square Hotel – Each of the rooms at Athens Center Square Hotel has been individually designed; even the corridors on each floor are different colors. The rooms are simple but smartly contemporary. There’s a delicious Greek breakfast buffet served up every day, plus there’s a bar and cafe on the rooftop – complete with a vista of the Acropolis and the Athens skyline. The Ermou shopping district is just a few paces from here, and so is a metro stop. Despite being central, the hotel is a quiet, calm place to stay. A six-foot column stood in the center of a barren square before a single house was built in this neighborhood. The column’s name was Kolonaki and that’s where this district got its name. This expensive neighborhood has now built itself beautifully into the southern slopes of the Lycabettus hill. Take a stroll through this upscale neighborhood and you’re likely to see signs of wealth. Whether it’s a Rolex on the wrist of a man sitting at a cafe or the Louis Vuitton logo sewed into the side of a walking woman’s purse, Kolonaki will not let you forget its opulence. 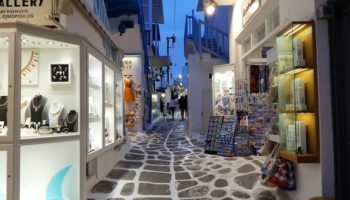 Needless to say, Kolonaki is where you’ll go for high-end shopping. Besides the opulent shops and incredible people watching, you’ll find a nice collection of museums in Kolonaki. The Benaki Museum is an incredibly preserved neoclassical manor house that boasts a fine collection of art which is just a short walk from another fine collection at the Goulandris Museum of Cycladic Art. St George Lycabettus – This large hotel is a decidedly luxurious affair, providing a world of comfort and relaxation for guests visiting historic Athens. The various rooms on offer feature everything from sleek, modern design to simpler rooms decked out with handpicked artwork. There’s a Mediterranean restaurant onsite that serves up a range of delicious dishes. A large rooftop area with a pool and cocktail bar (boasting a daily happy hour) offers fantastic views of the city. This 5-star hotel is located at the foot of Mount Lycabettus, with the funicular railway nearby. Hotel Lozenge – This is a gleaming, modern hotel that’s all about sleek, urban interiors. There’s a stylish and spacious restaurant with a living wall here, as well as pavement side terrace seating. The rooms are neutral, minimalist, and decorated with wood floors – some even have open-plan bathrooms. Furnishings throughout are design-led. You can hire a bike from the hotel to pedal around Athens. A popular uprising rocked Greece back in 1843. The people, with the military at their backs, demanded that the first King of Greece sign a constitution. 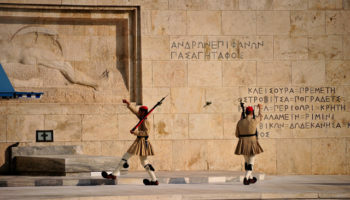 Syntagma Square, also known as Constitution Square, is named after the historic document. 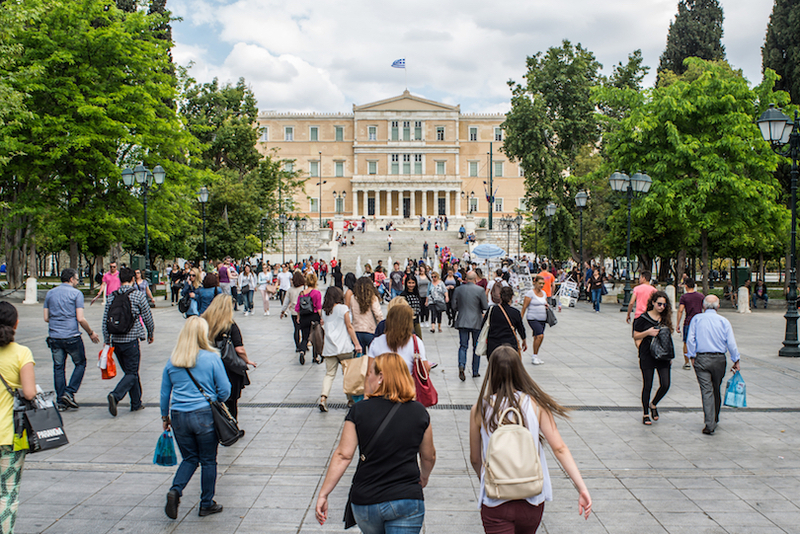 The square is a major part of Greece’s political history and you may even witness a protest or march during your visit. The Parliament Building sits near the square which is lined with cafes. The area bustles with energy every day. It’s a great place to people watch with a coffee at an outdoor cafe when the weather is nice. But the neighborhood is more than just a historic landmark. Two historical museums, the Numismatic Museum and the National Historic Museum, are worth a visit for ancient relics. 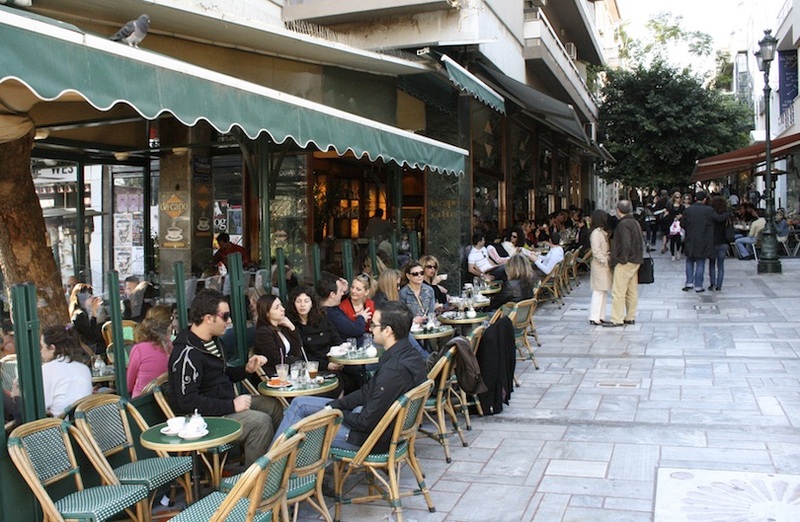 The Valaoritou pedestrian street takes you right to the square and is lined with chic cafes and authentic restaurants. And the fashionable Karytsi square is the hub of nightlife in the area. Hotel Grande Bretagne – Impressively situated opposite Constitution Square and the Houses of Parliament, this truly is a grand hotel set inside a historic, palatial building. Classic rooms are exquisitely decorated, with patterned tiled floors, ornate furnishings, and beautiful marble bathrooms. 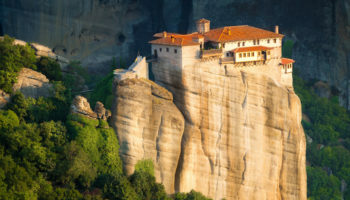 Some rooms feature balconies that look out at the Acropolis. Guests will be able to watch the famous changing of the guards at Parliament from here, too. There’s a spa with a variety on offer an indoor pool for utmost relaxation. You can dine on fine Mediterranean cuisine with views of the Acropolis. Electra Hotel Athens – The simple sophistication of this newly renovated hotel makes for a comfortable and relaxing place to stay. But the luxury doesn’t stop at the aesthetics; there’s also a pillow menu for guests and large beds for extra comfort. Staying here means taking breakfast at the rooftop restaurant and enjoying Mediterranean cuisine in the evenings at a more romantic restaurant. From the rooftop, you can enjoy views of Parliament, Syntagma Square, and the Acropolis. 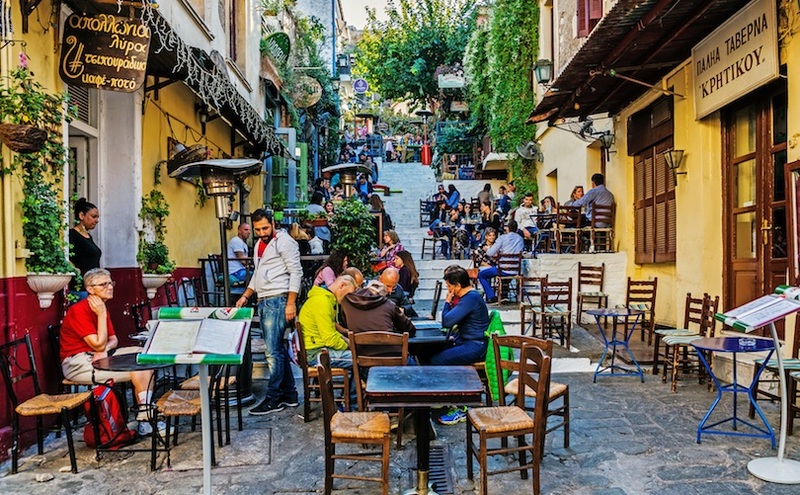 If you can peel your eyes off the nearby Acropolis and can stay away from the touristy Plaka, you can enter the kaleidoscope of the Koukaki neighborhood. You’ll get an undeniably local experience in this often overlooked piece of Athens. Koukaki is a sleepy place in contrast to the nearby Plaka neighborhood, but the district has a welcoming urban village feel. 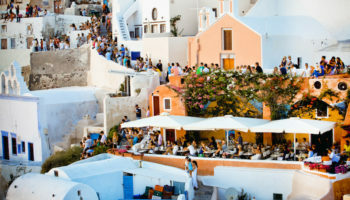 The restaurants and cafes are less populated but serve up more traditional Greek dishes. Make sure to visit the Trii Ark Hub after a quiet coffee to support the work of local artists. Stroll down the uneven sidewalks of the pedestrian Georgaki Olympiou Street running from Koukaki Square. You’ll be under the shade of bitter orange trees as you peruse local shops, cafes and restaurants. Then head over to the magnificent National Museum of Contemporary Art and the Ilias Lalaounis Jewelry Museum to round out your laidback day in Koukaki. Divani Palace Acropolis – True to its name, the Divani Palace Acropolis is a luxurious, grand place to stay. Everything about this place is subtle and sophisticated, with toned down, tasteful interiors. The beds are enormous. 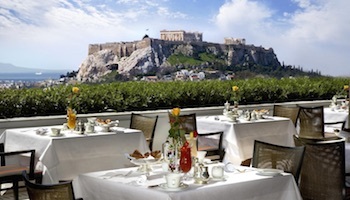 There’s an elegant rooftop restaurant with amazing, up-close views of the Acropolis. Another restaurant can be found inside the hotel, plus there’s a sleek hotel lounge to recline in. There’s a free shuttle bus from here to Syntagma Square, but also a metro station just 500 meters from the doorstep. Herodion Hotel – The Herodion Hotel is a stylish hotel just mere meters from the New Acropolis Museum, amongst other sights. Incredible views of the Acropolis can be had from this 4-star hotel – especially from the restaurant in the evening as the iconic sight is wonderfully lit up. There is a sun terrace and garden where guests can relax. Rooms at this 4-star offering are beautifully appointed and done in a multicolored palette that compliments the surrounding landscape. Some of the rooms feature views of the ancient Acropolis. Exarchia is the edgy part of Athens. You’ll stroll down streets covered in politically charged graffiti while the shops hawk anarchist books, rare vinyl records and wicked guitars. It’s the neighborhood you’ll enter when you want to hear some alternative live music while sipping on a heavy alcoholic beverage. But the image of this anarchistic neighborhood belies the food culture. You’ll find plenty of vegetarian and vegan restaurants in Athen’s most rock-and-roll district. The crowd in Exarchia is decidedly younger, and their youthful energy sometimes boils over with local authorities. You just might find yourself in the middle of an anti-capitalist march in Exarchia. The US State Department has issued a warning for travel to Exarchia in the past, but that was for one very specific politically charged incident. You should feel safe in the neighborhood and it’s worth visiting for the National Archaeological Museum of Athens, Vox, the city’s oldest theater, and Strefi Hill. Best Western Hotel Museum – This 3-star hotel is a simple, clean and comfortable choice for those looking for an unfussy, affordable stay in the historic capital of Athens. It’s a good choice for seeing what the city has to offer. Nearby, guests can find the Epigraphical Museum, the National Archaeological Museum, and there’s a metro station close by, too. There’s a delightful breakfast buffet every morning. Rooms at this hotel are classic and cozy; some even have their own balconies with city views. Glyfada is a southwestern suburb of Athens that stretches from Hymettus Mountain to the Saronic Gulf. It’s a fairly affluent place that has earned the nickname Hellenic Hamptons. The coastal border of the neighborhood is right in the heart of the Athens Riviera. The Asteras Glyfadas beach is the crown jewel of Glyfada. Enjoy clear waters, soft sand and plenty of amenities at this iconic beach. The Sea Turtle Protection Society Archelon should not be missed. You can marvel at the experienced staff as they nurse injured and sick sea turtles back to health before releasing them back into the wild. Head to the city’s digital planetarium in Glyfada after a day at the beach. You can catch jaw-dropping images of the universe, or you can choose to ogle at some modern art at The Blender Gallery. And, of course, this neighborhood is full of authentic restaurants where you can enjoy fresh seafood. Palmyra Beach Hotel – With a chic outdoor pool surrounded by charmingly rustic brick walls and trailing ivy, Palyrma Beach Hotel is a good option for those wanting to stay close to the sea. True to its name, there’s a beach just steps from the hotel. There are a variety of stylish rooms on offer, all with sleek, on-trend furniture and minimalist decor. The spacious restaurant serves a range of different dishes, whilst guests also have use of a fitness center. Sea View Hotel – Sea View Hotel boasts a gorgeous, grassy garden with its own outdoor swimming pool and shaded areas for guests to relax with a book. The hotel is a boutique style affair: lots of houseplants, natural wood, earthy colors, and design-led furnishings make for a stylish stay in the city. This is a relaxing place to stay and is well located close to Glyfada’s shopping street. It’s just a short walk from the seafront, too. Piraeus is south of Athens on the gulf and serves as the city’s port. 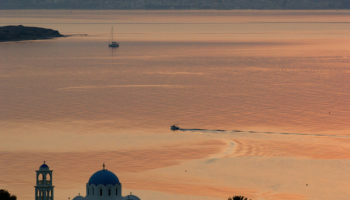 Many travelers find themselves entering Athens through Piraeus as they disembark their cruise ships. 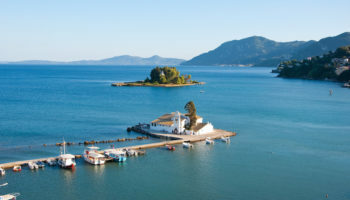 You’ll also have to port through Piraeus if you wish to take a boat to one of the many Greek Isles. And the port city is just a short metro ride to the heart of Athens. But Piraeus is a destination unto itself. Grab a coffee at an outdoor seaside cafe to check out the fancy yachts at the port of Zea, otherwise known as Pasalimani. The hilltop Castella neighborhood is worth a stroll for the beautiful neoclassical houses, the Prophet Elias church and the outdoor Veakeion theater. You can also catch plenty of culture in Piraeus. 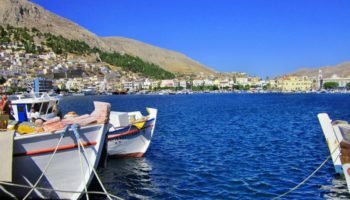 Catch a show at the historic Municipal Theater, visit the Hellenic Maritime Museum or drink in the beauty of one of many Greek Orthodox Churches in the city. 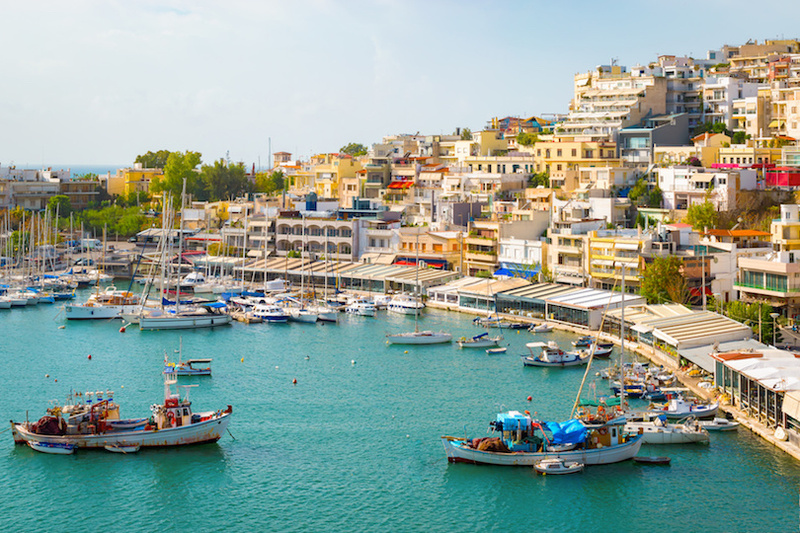 Depending on your needs, Piraeus puts you right in between the Greek Isles and Athens, and it’s a beautiful place to visit on its own. Triton Hotel Piraeus – This 3-star hotel might not be the most lavish or luxurious option; however, it’s in a fantastic location, just a few minutes away from Piraeus train station as well as ferry terminals. The rooms are decked out simply but feature furnished balconies that echo a traditional Greek style of outdoor living. These also come with views of the port. There’s breakfast on offer at this hotel, and an evening meal can easily be found in one of the many eateries in the surrounding area.